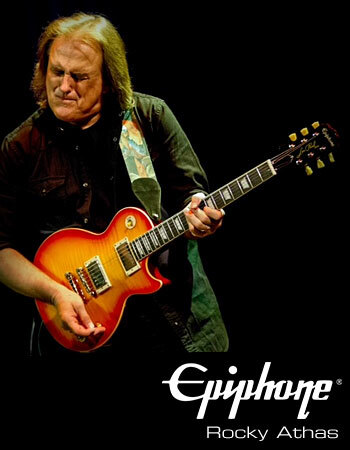 Rocky Athas, known by critics and fans as "The Texas Tornado", "The Malice from Dallas", "The Young Eric Clapton" and "The Last Great Bluesbreaker Guitarist", possesses an arsenal of punishing guitar riffs and catchy hooks that have opened every door. From recording his first solo album at Willie Nelson's studio with multi-Grammy winning producer, Jim Gaines to working with Buddy Miles and SRV's Double Trouble to Glenn Hughes to Joe Walsh and John Mayall, Rocky has a blues rock pedigree that reads like a Who's Who of musicians. With his wonderfully crafted new album "Shakin' The Dust", Rocky is here to announce his arrival from the international touring stage with the Godfather of British Blues to his rightful place front and center delivering his musical message with Texas style. After carrying the mantle of the coveted role of lead guitarist with John Mayall's legendary Bluesbreakers for eight years, Rocky Athas returned to his successfully established solo career and in 2017, the much anticipated reunion between Rocky's good friend and multi-Grammy winning producer, Jim Gaines, delivered Shakin' the Dust to rave reviews! His band of Texas musicians wowed audiences and ultimately led to John Mayall's invitation to join him as his guitarist. 2015 saw the release of the ultimate Rocky Athas collection highlighting his most crowd pleasing songs plus never before released bonus tracks which pay tribute to his influences like Eric Clapton and Leslie West. The release of The Essential Rocky Athas - Volume I & II is hailed globally by critics as " a delectable album tailor-made for the blues enthusiast" filled with "delicious howling guitar riffs". Don't miss this authentic Texas guitar legend and former Bluesbreaker! "Guaranteed to shake the dust from your speakers!" "Apologies to Walter Trout, Mick Taylor, Clapton, and all the other guitarists Mayall has employed through the years, but Rocky Athas is a real find, an instinctual player with imagination and subtlety..."
"Guitarist Rocky Athas recalls the young Eric Clapton..."
"[Rocky is ] a veteran Texas gunslinger with a wicked tone and thriving solo career of his own." "[Rocky's] Immortal...in the tradition of such famous artists as Eric Clapton, Mick Taylor and Peter Green." Athas has a unique approach and style to his axe work, which is hard to deny. His reputation as an amazing guitarist is no exaggeration. This guy is the real thing.